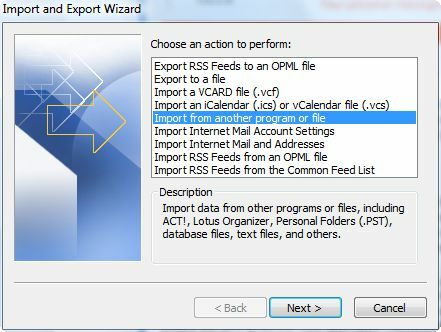 This process is super simple if you’re installing Outlook on the same computer that has your Outlook Express on it. However, if you simply want to backup your Outlook Express data from an older computer and import it into Outlook on a new computer, it’s not as simple as it should be. The problem is that when you start an import process from Outlook, it looks directly on the pc for all your Outlook Express files. Since it won’t find them, there’s no way it can import them because for some reason, Outlook doesn’t give you the choice of manually importing store folders from Outlook Express. The only workaround as far as I know is to import your mail into Windows Mail first and then use Outlook to import from Windows Mail. 2. 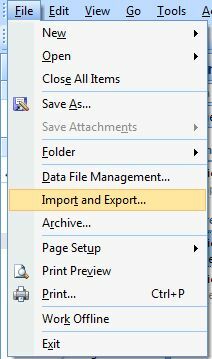 Click on the option to import from another program or file. 3. Click on the option to import from Outlook Express or Windows Mail. 4. Wait for the import process to complete.